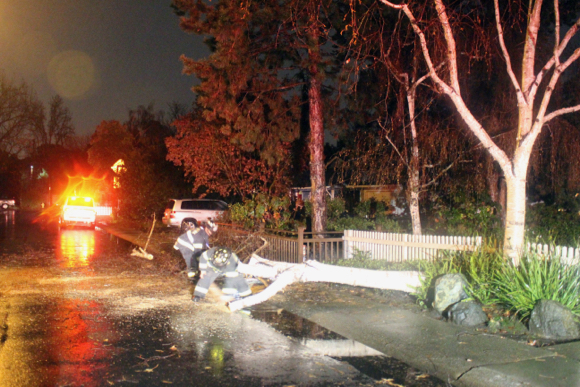 During the last series of winter storms, the Menlo Park Fire Protection District responded to 168 emergencies that were received through 911 calls. Crews came across other unofficial incidents as they drove around their first-response areas. Of weather-related significance were two power pole fires, 13 wires down, 13 trees down, nine public assist water-related and nine alarm soundings due to sensor activation or water-related issues. 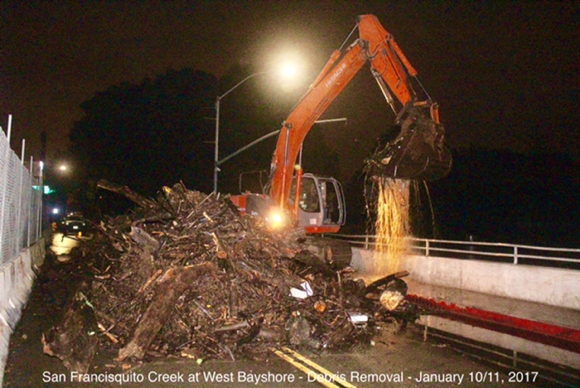 The only incident of significant concern was the volume and rise of water in the San Francisquito Creek at West Bayshore in East Palo Alto and the county border. Water height quickly rose to 11′ 9″ with a simultaneous high tide of over 7 feet just before midnight on January 10/11, 2017. Maximum capacity is listed as 12′ 8”. Combined with the trash racks and debris flow, there was concern of a duplication of the 1998 flooding of low-lying businesses and apartments between the creek and 7/11 convenience store along West Bayshore which required the Fire District to rescue hundreds of people. That didn’t not occur this time around.